Discussion in 'General Archive' started by kauza12, Nov 16, 2018. People like me will still bid on the 1,000 count ammo and 10 hour booster variants, Lmao, not going to help at all. It will still be the same group of people bidding on the items. Boosters and ammo would be too easy to get at an hourly rate, leading to Bigpoint receiving less revenue, hence why this will never happen. No efficiency with making multiple amounts. Take cloaks for example. Same people bid on them. I have seen single cloaks bid in triple digits. There is nothing in place that says who can bid on what. But the main issue is that it would be too easy to get ammo. BP will lose income. So, they won't apply it. Make it a blind auction. No player names as to who is top bidder, no highest bid amount posted. You put in a bid and take a chance you have won. Of course, any bids entered that do not win get refunded back. and DO do what they usually do : sod all. 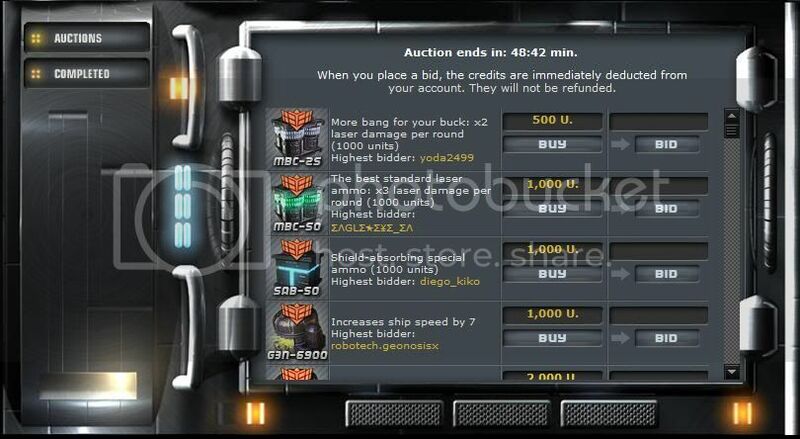 That's how the Auction system was back then. No good it will do now since the implementation of the new system. Only the name of the highest bidder was shown. Amount was not. And any credits bid were not refunded, regardless of you losing. no i actually think now its better, at least you get ur money back if you lose the bid instead of losing all the money without knowing anything..
Cloaks don't stack, as soon as the chip runs out, you have to equip another. Ammunition is an item that a single person can continuously keep bidding & winning to be saved up infinitely.